Homemade Hamburger Buns Eggless are really easy to make at home without eggs and vegan friendly too. 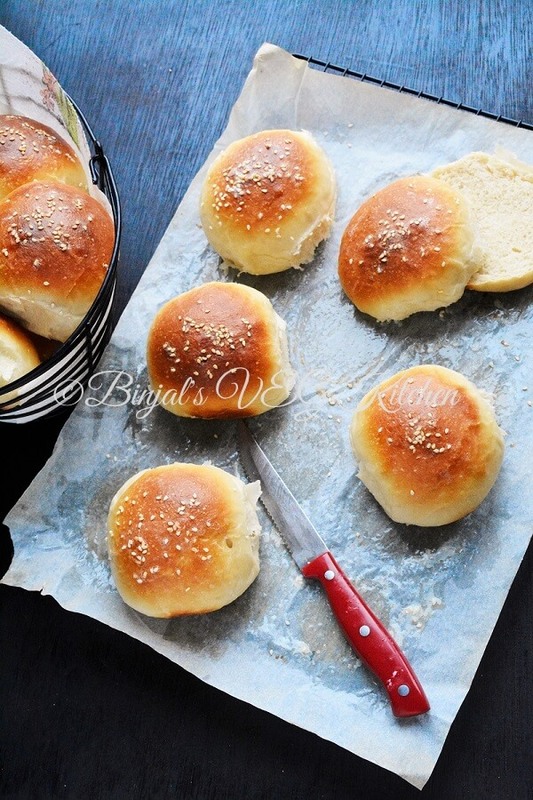 Homemade Hamburger Buns Eggless are taste really fresh and flavorful. Hamburger Buns are one of the most popular bun in the world. Hamburger buns are also known as Ladi Pav in India. Bun comes in many shapes and sizes, but the Hamburger Bun is most commonly with a hand-sized, round top and flat bottom. You can keep them soft and fluffy longer. After making Homemade Hamburger Buns Eggless this way I am sure you will never buy burger buns from the store. 1. Take a small bowl, add ½ cup lukewarm milk, sugar, yeast and mix it well, covet it for 7-8 minutes till foamy mixture. 2. Take a large mixing bowl, add bread flour, wheat flour, salt, flex seed powder or vital wheat gluten flour and mix well. 3. Add oil in the yeast mixture, then add the yeast mixture in the flour mixture and make a sticky smooth dough using lukewarm water as required. 4. Dust the dry flour on kitchen working surface, turn the sticky dough on dusty flour and knead it about 5-6 minutes till smooth dough like elastic. 5. Apply few drop of oil on dough, cover it and keep aside for till double or 45 minutes to an hour. 6. 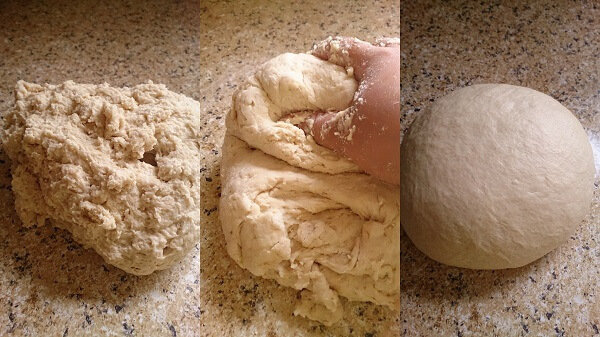 Take the raised dough, punch it down and knead it again for2-3 minutes. 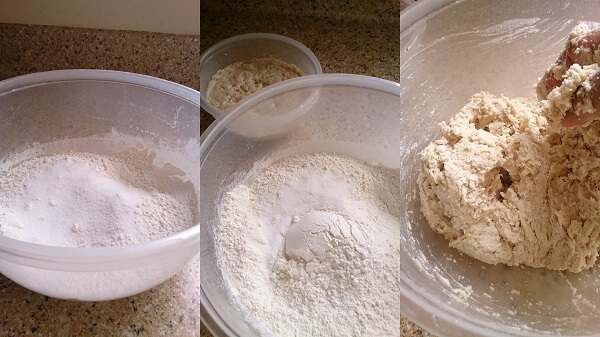 Now divide into 12-14 equal size small-small portion and make round shaped balls. 7. Take the baking tray, grease the tray or you can use baking sheet and place the ball on it. Keep the little space between each ball to raise. Cove the tray with warping paper or cloth, and keep aside for 1 to 1 ½ hour till double the size. 8. Preheat the oven on 425 F degree or 200 C degree temperature. 9. Take a small bowl, add 1 tbsp milk, 1-2 tsp melted butter and mix it well. Once ball become double, sprinkle some sesame seeds, and then brush milk-butter mixture lightly on raised ball. 10. Place the tray in preheated oven and bake it for 12-15 minutes or till outer golden brown. 11. Now your buns are ready, apply butter on hot buns, remove the buns on cooling rack, let it them cool down. 12. Homemade Hamburger Buns Eggless are ready for serving, now make your own style burger as per your choice and serve it. 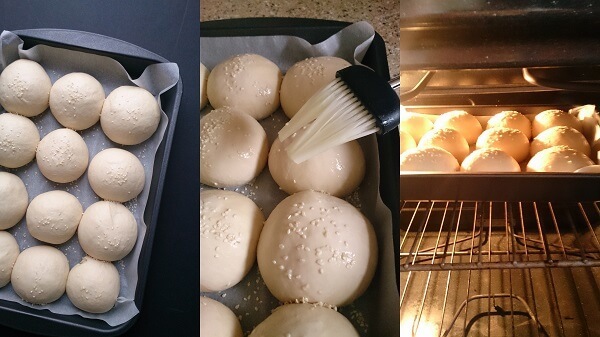 • Use always good quality of yeast to make Homemade Hamburger Buns Eggless. • Do not add yeast in the hot milk/water otherwise your yeast will not be worked. • If you are vegetarian you can use regular milk or butter, I used almond milk and vegan butter for vegan Homemade Hamburger Buns Eggless recipe. 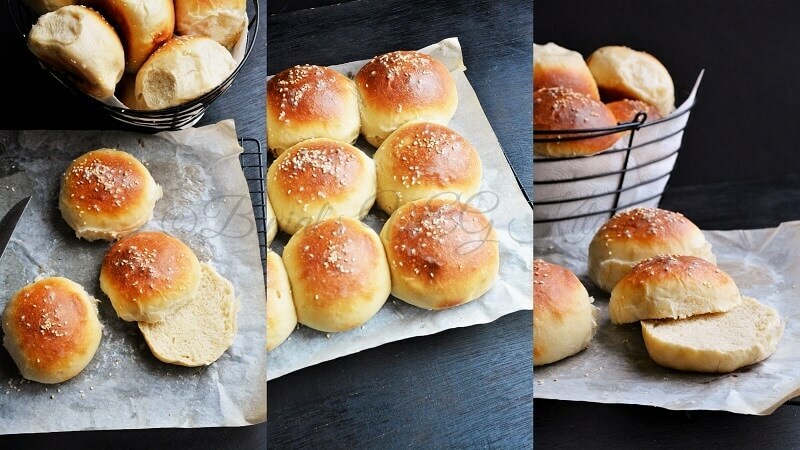 • Homemade Hamburger Buns Eggless can be store for 3-4 days. 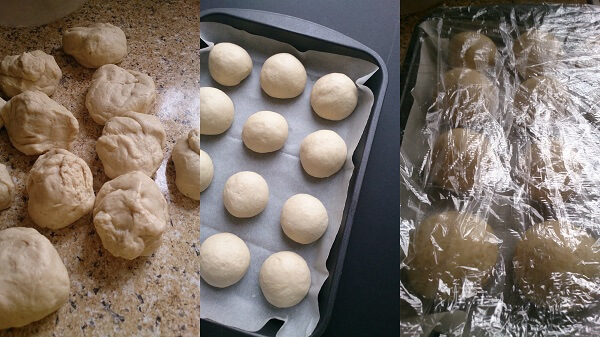 • Kneading is the must for this recipe to make gluten in your dough, because gluten make your buns soft and fluffy. Homemade Hamburger Buns Eggless are really easy to make at home without eggs and vegan friendly too. 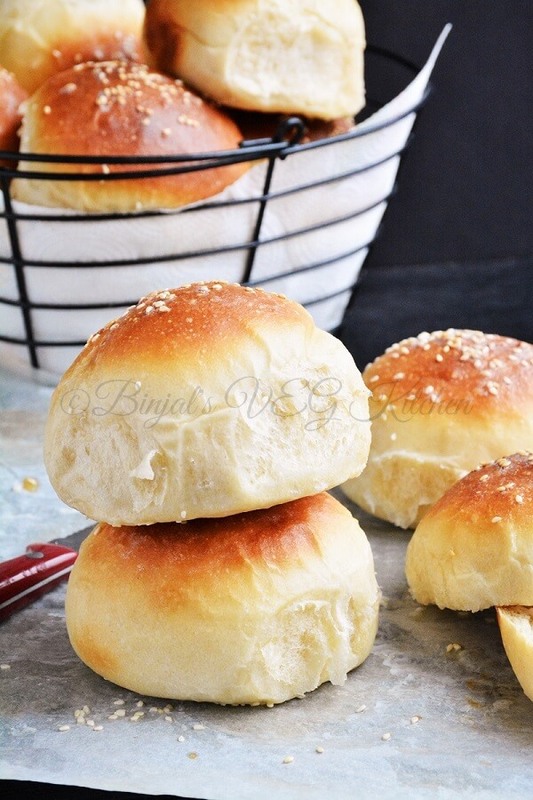 Homemade Hamburger Buns Eggless are taste really fresh and flavorful. Hamburger Buns are one of the most popular bun in the world. Hamburger buns are also known as Ladi Pav in India. Bun comes in many shapes and sizes, but the Hamburger Bun is most commonly with a hand-sized, round top and flat bottom. Take a small bowl, add ½ cup lukewarm milk, sugar, yeast and mix it well, covet it for 7-8 minutes till foamy mixture. Take a large mixing bowl, add bread flour, wheat flour, salt, flex seed powder or vital wheat gluten flour and mix well. Add oil in the yeast mixture, then add the yeast mixture in the flour mixture and make a sticky smooth dough using lukewarm water as required. Dust the dry flour on kitchen working surface, turn the sticky dough on dusty flour and knead it about 5-6 minutes till smooth dough like elastic. Apply few drop of oil on dough, cover it and keep aside for till double or 45 minutes to an hour. 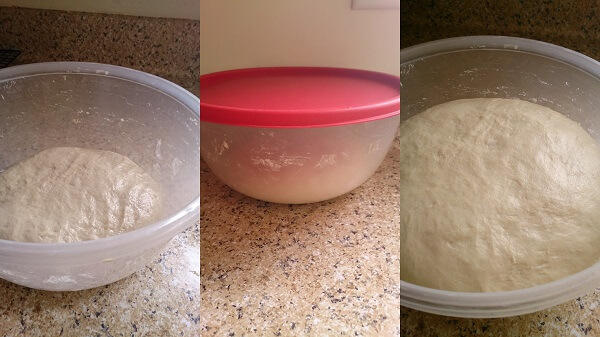 Take the raised dough, punch it down and knead it again for2-3 minutes. Now divide into 12-14 equal size small-small portion and make round shaped balls. Take the baking tray, grease the tray or you can use baking sheet and place the ball on it. Keep the little space between each ball to raise. Cove the tray with warping paper or cloth, and keep aside for 1 to 1 ½ hour till double the size. Preheat the oven on 425 F degree or 200 C degree temperature. Take a small bowl, add 1 tbsp milk, 1-2 tsp melted butter and mix it well. Once ball become double, sprinkle some sesame seeds, and then brush milk-butter mixture lightly on raised ball. Place the tray in preheated oven and bake it for 12-15 minutes or till outer golden brown. Now your buns are ready, apply butter on hot buns, remove the buns on cooling rack, let it them cool down. 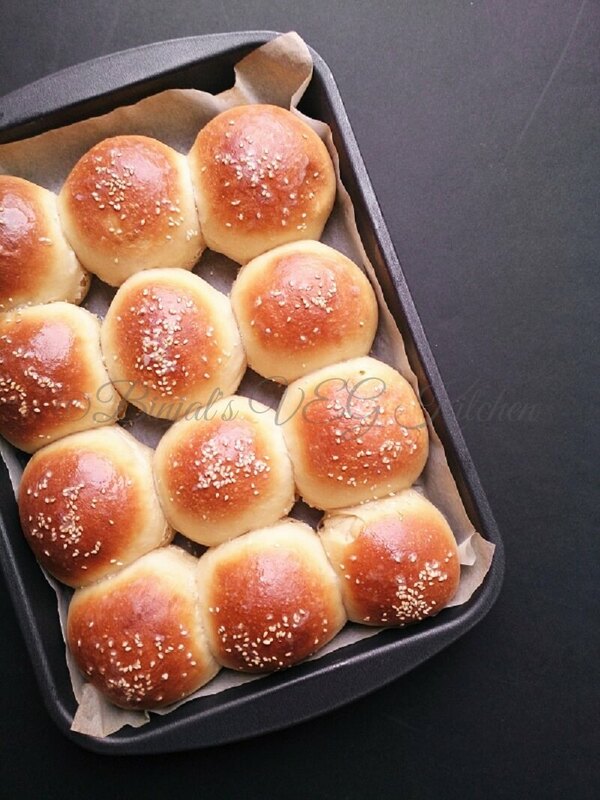 Homemade Hamburger Buns Eggless are ready for serving, now make your own style burger as per your choice and serve it. 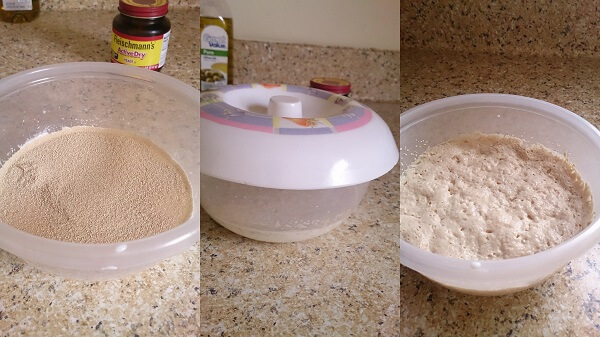 • Use always good quality of yeast. • If you are vegetarian you can use regular milk or butter, I used almond milk and vegan butter for vegan recipe. • It can be store for 3-4 days. I tried these last weekend. I made a few of them a little too flat so they didn’t rise as much as I would have liked but still taste good and that is an easy fix for next time. Thanks sooo much for your help! Can the dough be made in a bread machine on the dough cycle? yes you can store in fridge not in freezer! Hi how are you? Your recipe is super delicious and easy to make! Thank you! I am having a little trouble with the dough raising the second time when in small balls. I’ve tried leaving them in the off oven with a towel over them, then my second try I left them outside with a towel and they raised a little more. This time I’m electing them rise outside with plastic wrap. Hopefully this time they come out raised higher. Either way they all came out delicious and my kids and hubby loved them. I guess with practice I’ll eventually get it right! Thank you so much. I have been using your recipe to make the buns since bread in the grocery stores is non existent right now because of the Hurricane in Houston! Your recipe saved my family for a couple of days! Lots of Love and happiness your way! Hey did you brush the milk and butter mixture on top? Yummy, thanks for sharing !